Our Water Pure Pro™ is a high-performance water purifier that can be used when life’s unexpected emergencies occur. Rain, river, and even pool water can be purified into drinking water with no power supply necessary. We have already installed Water Pure Pro™ for local governments around the world. In emergencies, we can not only rely on plastic water bottles. A stable water supply is needed for various living situations. Even tap water faucets can still contain bacteria and rust. 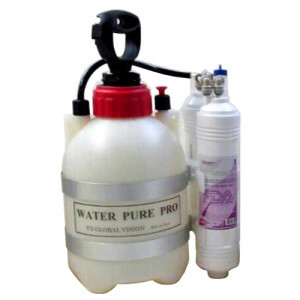 Water Pure Pro™ is your solution to safe and purified water. ■ Our delivery time is about 2 weeks after your order receipt. Processing method of cartridge: Although correspondence differs depending on each municipality, it seems to be treated as incombustible garbage.